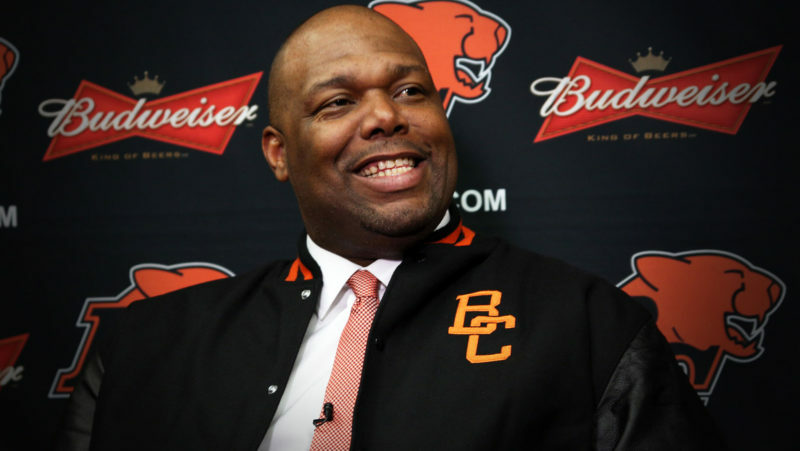 It was kind of a running joke outside the two CFL markets throughout the offseason: “when will the B.C. Lions change their colours to green and gold?” True, the 2018 edition of the squad has a large portion of ex-Eskimos. It started with the hire of GM Ed Hervey last November, subsequent addition of president Rick LeLacheur in time for the new year and trickled over into the free agent period. After a trade for Odell Willis in early February, no less than nine additions in free agency once suited up in the Alberta capital, including defensive back Garry Peters. 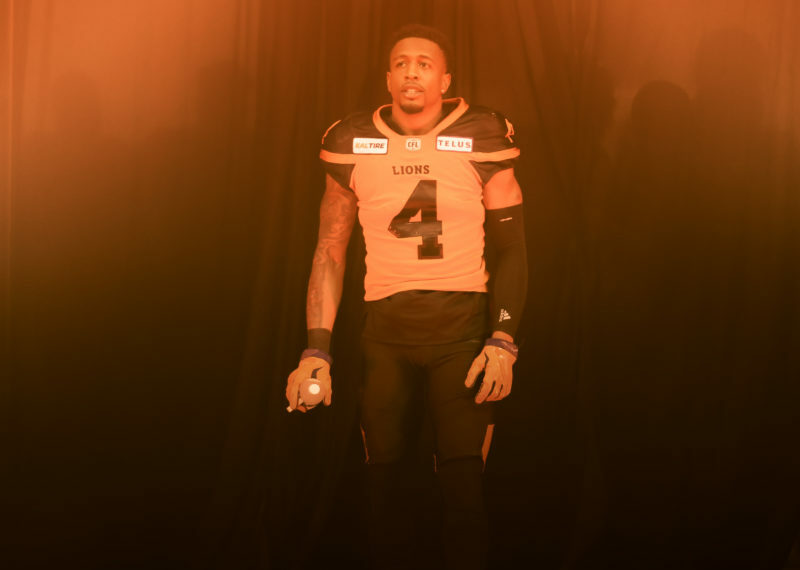 As he and a few others prepare for a return to their former home this Friday, the former Clemson star says there should be more positives than negatives to the Edmonton invasion. “It’s made my transition easier because I know what a lot of these guys are about and the kind of winning attitude they are bringing to our program,” explained Peters. After a season-opening win over Montreal and bye in week number two, Peters and the Lions are also looking to prove they belong in a competitive Western Division. They are also no doubt facing a hungry Eskimos squad, in wake of their 38-21 home loss to the Hamilton Tiger-Cats last Friday. One thing remains the same: in order to have any success, they must find a way to contain 2017 CFL Most Outstanding Player Mike Reilly. The former Lions backup has thrown for 694 yards through two weeks, tops in the league. Peters and his friends might know a thing or two after practicing against him on a regular basis. “Montreal was a good test, but I think Edmonton is going to be an even bigger one,” said Peters. 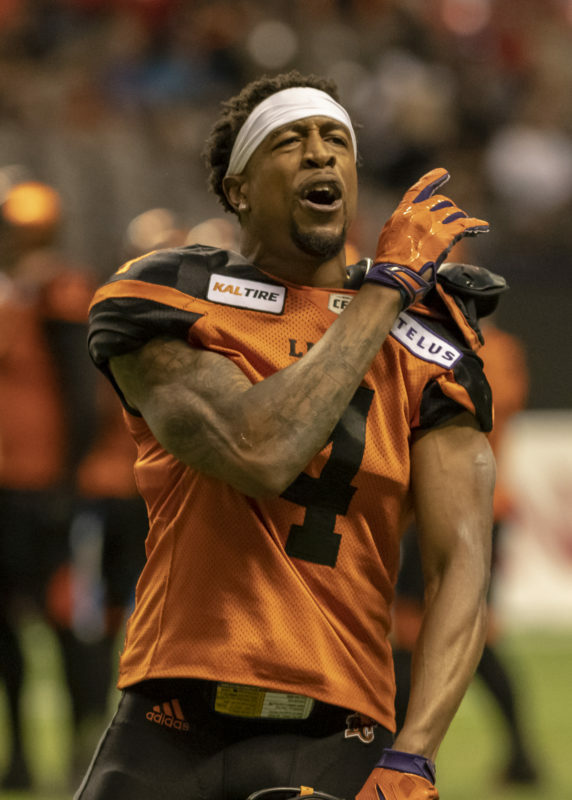 Lions defensive back Garry Peters celebrates during a victory over the Montreal Alouettes on June 16th/2018. Photo: David Friederich. Along with his entire staff, Wally Buono has made the most of the early bye week and is preaching to his players to remain focused on one thing: starting the season 2-0. “I haven’t really focused on that,” said Buono of the amount of former Eskimos on his roster. Having said that, one thing the visitors may definitely have on their side is that motivation factor. Who doesn’t want to stick it to their former club? “I’m so excited. I’ve been looking forward to this game since I signed with B.C.,” added Peters. Make sure the pizza is ordered and the beverages are cold. It should be one great Friday night reunion. 2017 season series: the Eskimos won all three meetings, including a 37-26 result in the lone matchup at Commonwealth Stadium July 26th. Lions last result: a 22-10 home victory over Montreal in week one. Eskimos last result: a 38-21 home loss to Hamilton in week two. Gameday weather forecast: a mix of sun and cloud with a high of 22 degrees Celsius, low of 11 degrees Celsius. What area must the Lions focus on most in Edmonton? Taking Advantage of a Depleted Eskimos’ D? 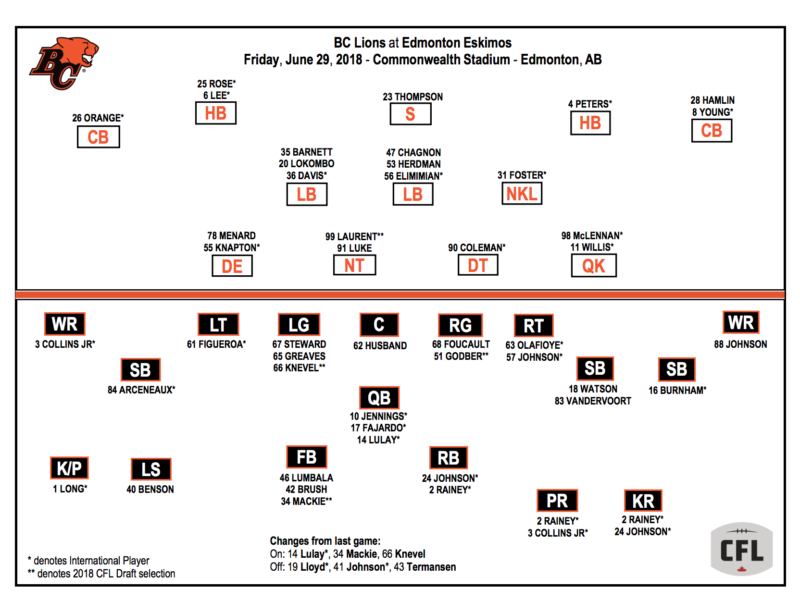 Although they added former Lions’ top pass rusher Alex Bazzie on day one of free agency, both Willis and Philip Hunt were key departures from an Edmonton defensive front that did a fair bit of damage last season. Linebacker Adam Konar was put on the six-game injured list after a week one victory in Winnipeg. The mindset of Jeremiah Johnson and company? Attack early and often, especially on the ground. “That’s the goal. We want to attack, get those guys on their heels and let them know from the beginning that it’s going to be a rough one,” said Johnson. Establishing a running game is probably one thing the offence wants to improve on from the last game. Johnson finished with just 52 rushing yards on ten carries, while Jonathon Jennings was the team’s leading rusher, finishing with a career-high 57 on the ground. A more balanced attack could go a long way in getting that highly coveted second win. “We want to be the same, look the same and execute the same, but we want to actually come out here and have a fast start, put some points on the board early, in the middle end at the end” added number 24. 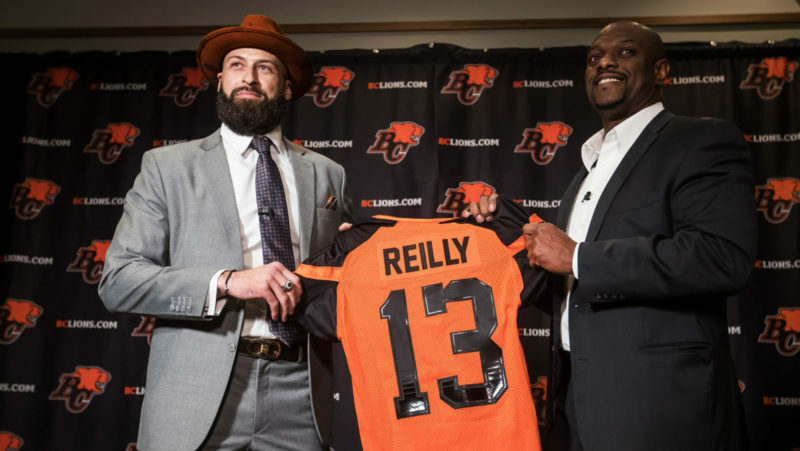 Contain Mike Reilly- Edmonton’s best player will play a big role in whether or not the hometown team can bounce back against the rested Lions. Extend Drives- chewing up those yards and tiring out the Edmonton defence for a second straight week could be the big formula. Eliminate Penalties- we’ve used it before, but as far as special teams go it was a job well done against the Alouettes. The long road back is complete: 295 days after suffering his knee injury, Travis Lulay will dress as the third-string quarterback behind Jennings and Cody Fajardo. Tip of the cap to the 34-year old for his hard work in getting back. Hunter Steward is expected to slot in at left guard after missing practice time in the middle of the week. We hate to keep harping on it, but you get the sense we might be due. 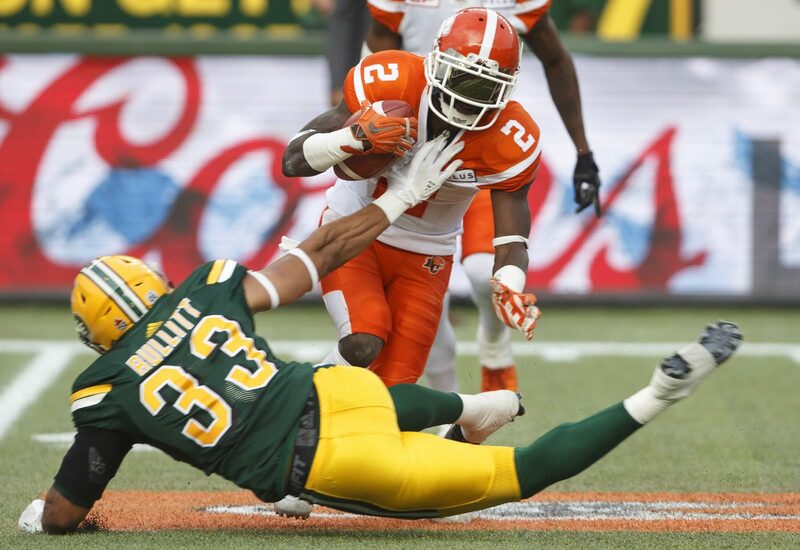 The Lions have lost five straight in Edmonton with the last victory coming on July 13th, 2013. Travis Lulay threw touchdown passes to Andrew Harris and Emmanuel Arceneaux in that rain-soaked, 17-3 triumph. 2013 was also Hervey’s first season as GM of the Eskimos. One more trend to reverse: the record coming off a bye. Since Buono’s return to coaching before the 2016 season they are 1-3-0 in the first game back after a break. Stats of the week: You might want to call him ‘Red Zone Reilly.’ Through two games, the Eskimos offence has scored touchdowns on four of their five trips to the red zone. The Lions were one for two in their victory over the Alouettes. Reilly has also rushed for a CFL-leading three touchdowns, while Derrel Walker leads the league with 232 receiving yards. Chris Rainey‘s 92 punt return yards were the highest CFL total in week one. Despite playing only one game, the Lions’ defence is second in the league with five sacks. Milestone watch: The Rain Man needs just 79 more to pass Tim Brown for the third-most punt return yards in franchise history. Cory Watson needs eight more receptions to reach 300 for his career. As Buono was eluding to above, Edmonton will host the 106th Grey Cup on Sunday, November 25th. Commonwealth previously staged the big game in 1984, 1997, 2002 and 2010. Hervey and the hometown Eskimos were beaten 25-16 by Montreal in the 2002 game. We mentioned the weather forecast above. Can we assume it’s safe to say the Eskimos won’t be affected by a thunder and lightning delay for a third straight week to start their season? You can listen to the action on TSN 1040, beginning with the pre-game show at 5:00 PM PT with Lowell Ullrich. Bob Marjanovich, Giulio Caravatta and sideline reporter Karen Surman bring you the action from Commonwealth Stadium at 7:00 PM PT. Viewers can watch on TSN 1, while Lions fans south of the border can tune in on ESPN 2.